Canada's RJ Barrett scored 28 points and No. 4 Duke held on to beat Wake Forest 71-70 on Tuesday night after Chaundee Brown's jumper rimmed out at the buzzer. Canadian RJ Barrett scored 28 points and No. 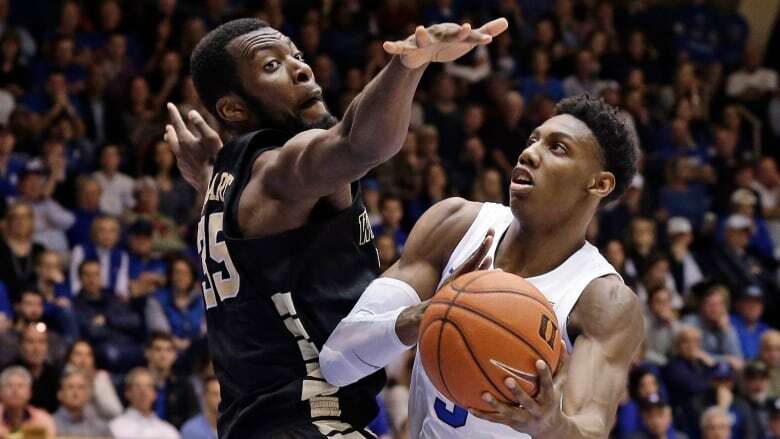 4 Duke held on to beat Wake Forest 71-70 on Tuesday night after Chaundee Brown's jumper rimmed out at the buzzer. Tre Jones added 13 points for a sluggish Duke team missing star freshman Zion Williamson for a fourth straight game with a sprained right knee. The Blue Devils (26-4, 14-3 Atlantic Coast Conference) overcame 41 per cent shooting and a 16-for-26 showing from the free-throw line to win their 10th straight in the in-state series. Williamson's absence, coupled with a rough game from No. 3 option Cameron Reddish, left Barrett, from Mississauga, Ont., as essentially a one-man show for Duke. The Blue Devils — 26-point favourites — trailed by 10 with 16 minutes remaining and never led by more than three until the final three minutes.